Asia has a new champion! 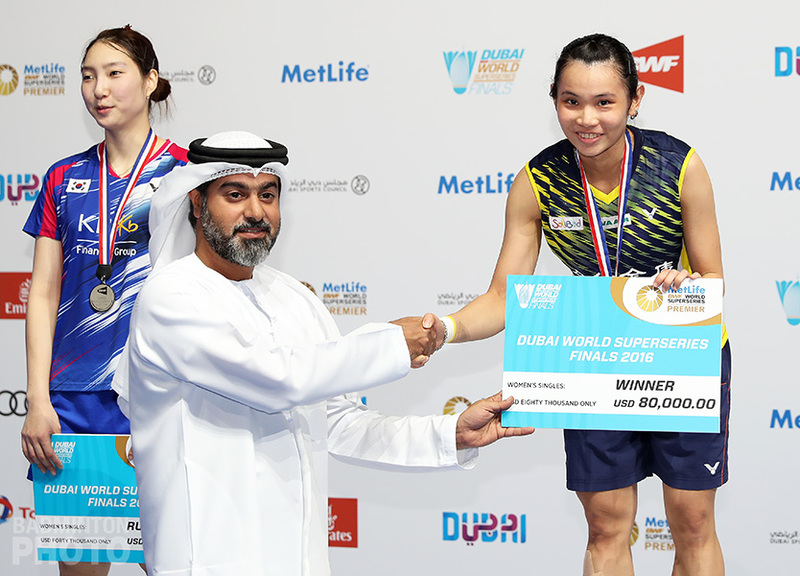 The 2012 Badminton Asia Youth Under 19 Mixed Team Championships saw Japan add its name to the honour roll as they became only the fifth nation to win a team title since the inaugural event, and the fourth since the advent of the mixed team event. It isn’t as if Japan wasn’t threatening to become the Asian Junior Mixed Team Champions. Way back in 2007, they had beaten then defending champions Korea and have been encroaching on China and Korea each year in their annual Tri-nation Games. But today in Gimcheon, Japan’s juniors finally got it right. 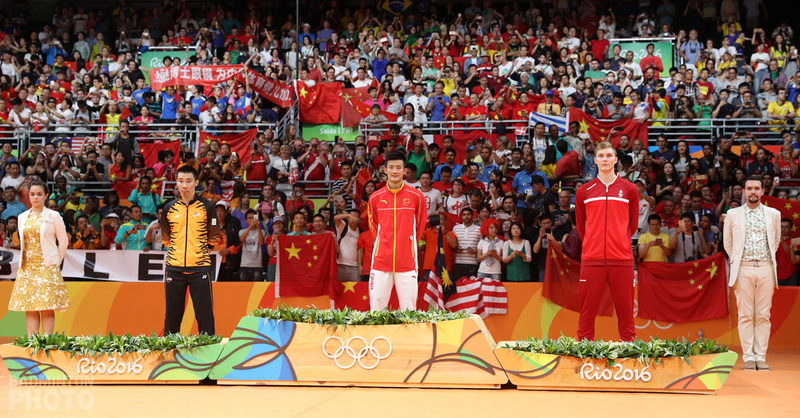 Everything came together as they trounced defending mixed team champions China in three straight matches to snare the gold. Key to the Japanese victory was the ability of Akira Koga / Akane Yamaguchi (pictured below) to put behind them their defeat in the group round robin tie with China and grab the first point from Pei Tianyi / Huang Yaqiong. “It wasn’t that we came into today’s match with a particular strategy,” said Akira Koga after receiving his gold medal, “the difference was that today we played with heart. “Today we were able to minimize our mistakes and we did our best to keep the shuttle going down. By having the first point, we hoped this would provide a lot of encouragement to the team. Even with the mixed doubles in hand, the tie was far from over, but fortunately for Japan, they had some strong contenders in both the boys’ singles and doubles. First up was Kento Momota. 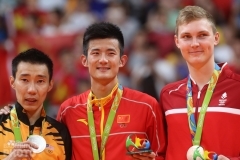 His opponent, Xue Song (pictured above left; Kento Momota right), lost in last year’s individual event to the eventual champion but he’s been virtually unheard-of since. Still, Xue took the first game and came back from 15-20 down in the second to earn his own match point, before a line call he protested desperately bequeathed the second game to Momota. 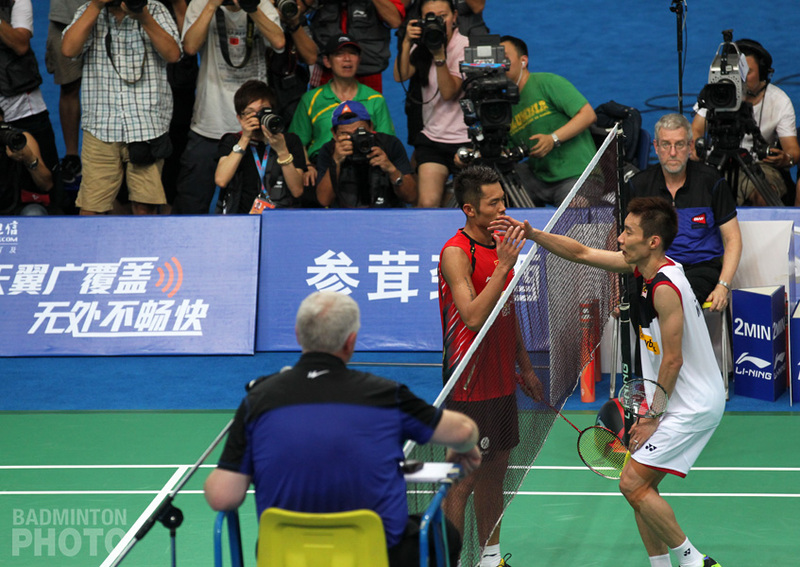 In the third game, Momota used his power only sparingly against the high-flying, diving Xue. Kento preferred instead to control the net and also his own errors and he marched methodically to victory in the decider. Last up was the men’s doubles and here Takuto Inoue / Yuki Kaneko (pictured below) seemed to win on consistency and sheer spirit, Kaneko in particular doubling over to exhult in nearly every point won. Despite Japan’s prowess going into today’s final, few would have predicted a shutout for the new champions. 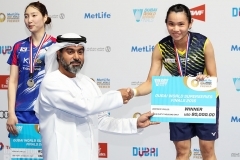 Hence, it was a great surprise that the two headliners, 2011 Asian Junior Champion Sun Yu of China and current #3 in the World Junior rankings Nozomi Okuhara (pictured above, right, with Sun Yu), were not to appear on court. 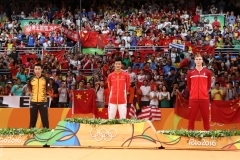 In fact, they just happened to appear together on the podium. Nozomi joked upon climbing to the top level, that she and many of her team-mates still were not at eye-level with their Chinese opponents one step down. As with some of the earlier rounds, there were both veterans and retirees on hand to watch their successors come into their own. 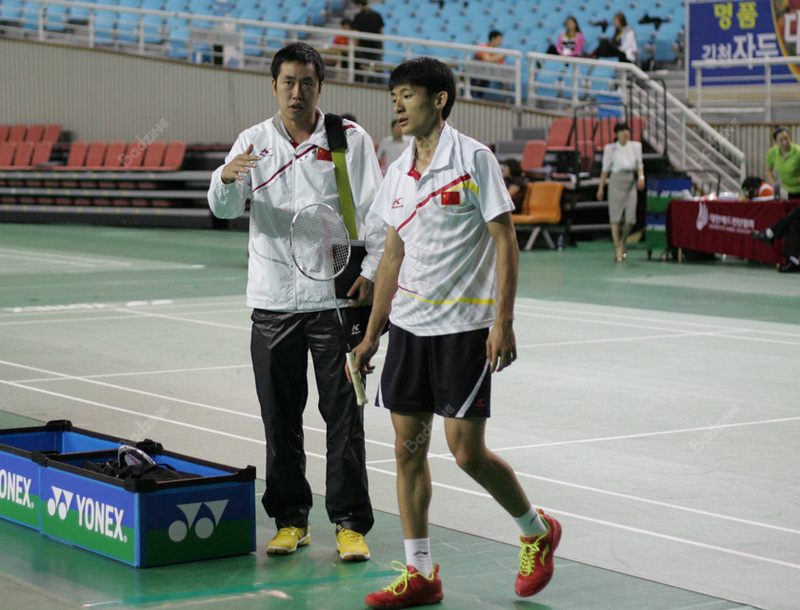 Former top international Chen Yu was seen coaching Xue Song (pictured above) throughout the week. 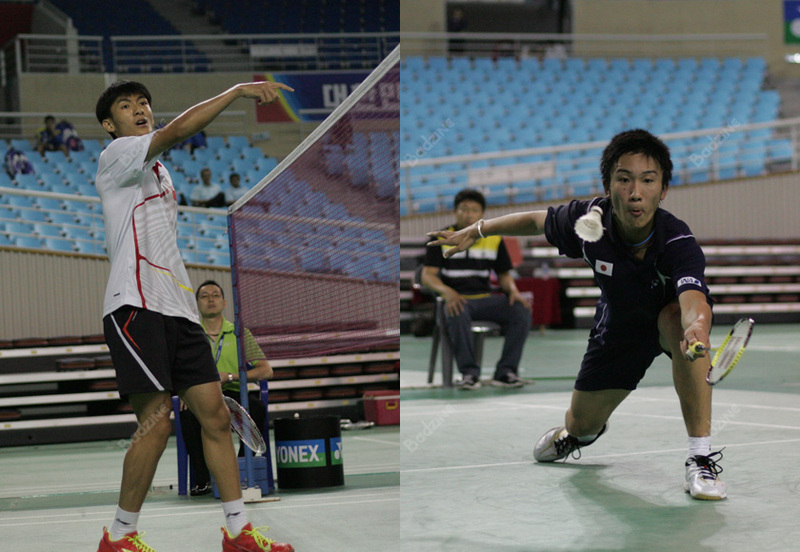 Also, the organizers drew heavily on the help from the local Gimcheon pro team, including Asian Games gold medallist and 2007 World Junior Boys’ Doubles Champion Shin Baek Cheol (pictured below), who was calling lines in the match won by two youngsters who may just earn his former title later this year. But first things first, the individual event of the Asian Juniors kicked off early in the afternoon following the mixed team final. Stay tuned with Badzine as we bring you live photos and reports from the later rounds.